During a raid in the Brussels neighborhood of Schaerbeek, police found an "explosive device containing nails," "chemical products" and "an ISIS flag." A third explosive that did not go off at the Brussels airport was inside a suitcase. At least 31 people have been confirmed dead in multiple explosions in Brussels, with at least 250 injured, including nine Americans. Top U.S. lawmakers briefed on the Brussels attacks believe the arrest of Salah Abdeslam accelerated the timetable for the sophisticated series of bombings in Brussels. A series of explosions rocked Brussels Tuesday, killing at least 31 and injuring at least 250, including nine Americans in devastating terror attacks for which ISIS took credit. The explosions, which drew condemnation from world leaders and sparked a cry for solidarity with the Belgian people, took place in Brussels Airport and a subway station near the European Union offices, leaving behind carnage and sending people screaming and running for their lives. A manhunt was underway Tuesday night for one of the suspected attackers, who was spotted on surveillance video at the airport wearing a white coat. Belgian authorities said that during a raid in the Brussels neighborhood of Schaerbeek, police found an "explosive device containing nails," "chemical products" and "an ISIS flag." Two devices exploded at the airport and a third, which did not explode, was found in a suitcase, leading authorities to believe the other bombs were hidden inside suitcases, the Mayor of Zaventem, Francis Vermeiren, told ABC News. Two of the three suspects from the airport explosions were believed to be suicide bombers, the Belgium Federal Prosecutor said in a press conference Tuesday. Belgian authorities have shared the names of the attackers with U.S. authorities, according to a senior U.S. official who was briefed on the situation. ISIS said today that its "fighters" were responsible for the attacks, according to an ISIS-affiliated website, as authorities search for a suspect on the loose. The terror group claimed it "carried out a series of bombings with explosive belts and devices" in "the Belgian capital Brussels, a country participating in the international coalition against the Islamic State [ISIS]," according to the site. The claim cannot be independently verified and there's been no official word from Belgian authorities. In the wake of the attacks, President Obama ordered U.S. flags to be flown at half-staff until March 26 to honor the victims of the Belgium attacks, the White House said in a statement. And top U.S. lawmakers briefed on the Brussels attacks said they believe the arrest of suspected Paris attacker Salah Abdeslam on Friday accelerated the timetable for the sophisticated series of bombings. The attacks began with two explosions at the departure hall of Brussels Airport in Zaventem, Belgium, about 8 a.m. local time today, according to Prime Minister Charles Michel, where the Belgian Crisis Center said at least 10 people were killed. A third explosive that did not detonate was found inside a suitcase and was neutralized by police. Three Americans -- Mormon missionaries -- were "seriously injured" in the blasts, according to Eric Hawkins, a spokesman for the Church of Jesus Christ of Latter-day Saints. A French missionary they were dropping off at the airport was also injured. A member of the U.S. Air Force, as well as his family, were also injured in the attack at the airport. The status of their injuries is not being released due to privacy concerns, the Air Force said in a statement. "We are saddened by today's attacks and extend our sincere condolences to the victims and families of those impacted," said Secretary of the Air Force Deborah Lee James. "Our priority at this time is the safety and well-being of our airmen and their families." Belgian Ambassador to the U.S. Johan Verbeke told reporters that "statements ... cries" had been pronounced in Arabic at the airport, "so that is the first indication of what the source is maybe, but I don't want to elaborate on that because that is definitely something that has to be further investigated." Verbeke said he did not know what was said in Arabic. There was also an explosion a little over an hour later on the rail tracks at the Maelbeek subway station, according to a spokeswoman for Brussels transportation department. 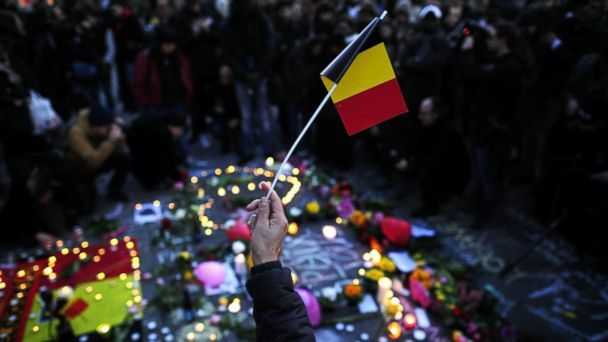 At least 21 people were killed there, the Belgian Crisis Center said. Between the two sites, officials estimate that more than 250 people were injured, according to Belgium's Health Ministry. A man who narrowly escaped the explosion described it as "a blanketed thud, and a cloud of dust rose up into the air." Ian McCafferty, who got off the metro car one stop before the explosion detonated, said he was walking up the stairs to ground level when "there was one loud thud and a shake." Once he got to the top of the stairs, he saw soldiers "eagerly evacuating the metro station." A surveillance photo released hours after the attack showed three men whom Belgian authorities identified as possible suspects in the airport bombing. Police released a public bulletin saying they are searching for the man in the light jacket and dark hat and asked for public assistance in finding him. Meanwhile, President Obama addressed the attacks while on a trip to Cuba, saying Americans "stand in solidarity" with Belgian people and that the United States will "do whatever is necessary to support our friend and ally Belgium in bringing to justice those responsible." The subway system has been closed entirely and Brussels airport officials have been advising people not to travel to the airport. "This is the worst attack that our country has known," Belgian Prime Minister Charles Michel said this afternoon. "Freedom was attacked in its heart, like it was attacked in Paris, in London, and in Madrid. This is a fight we are fighting together," Michel said. He went on to say that more security measures will be announced Wednesday. The explosions come as Abdeslam, a suspect in the Paris attacks, was detained last week in Belgium by Belgian authorities. The attacks prompted an international response, with senior law enforcement officials in the United States confirming to ABC News that Homeland Security and FBI officials are monitoring closely. New York Police Department officials have also confirmed that they are monitoring the situation closely. A senior U.S. official told ABC News that U.S. Transportation Security Administration chief Peter Neffenger happened to be in Brussels and was actually on airport grounds at the time of the bombing there. He is in a safe place, the official said. NATO, which is headquartered in Brussels, announced that it is increasing its "alert state," after decrying the "cowardly attack." The French Interior Minister confirmed that 1,600 extra police officers have been deployed near French transportation hubs in the wake of today's explosions. France had already sent out an extra 500 extra police near the country's borders after Abdeslam was arrested last week. The French Army posted a message of support for Belgium on Twitter, along with a photo of soldiers with heavy weapons at what appears to be a transportation hub. "More than ever, the French army is mobilized against the terrorist threat. We will win this war," Gen. Pierre de Villiers said in a quote posted on the Army's Twitter account. The Metropolitan Police in London have released a statement confirming an increase in deployment, saying that "forces across the U.K. have increased policing presence at key locations, including transport hubs, to protect the public and provide reassurance. This is not in relation to any specific information or intelligence." So has the U.S. Embassy in Brussels, releasing a statement urging U.S. citizens to shelter in place and avoid all public transport.